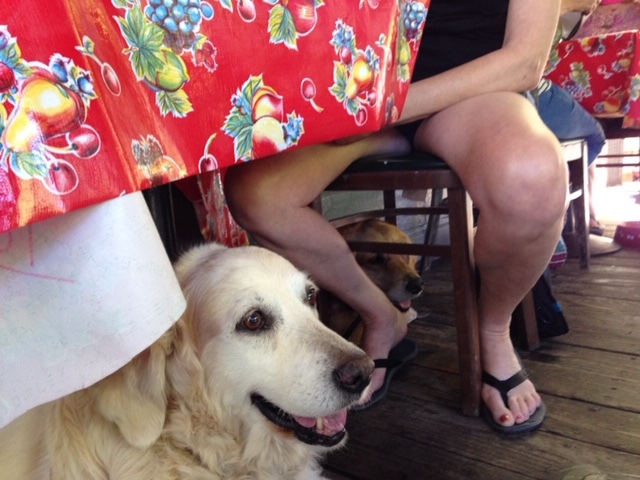 I took Hannah and Zig everywhere in CA and they were very well behaved even in places with treats at nose level. So yes it’s practice. Even a mom has to watch her human child while shopping. Here’s a thing I’ve noticed: businesses would rather ban all dogs than ask the irresponsible owners to leave and let the responsible ones stay. Like our local farmer’s market for example. A few people were bringing their aggressive dogs, un-muzzled, into the market, and a few people were letting their dogs jump up and put their paws on the tables, a big nono as some of these tables contained food. None of these owners were ever asked to take their dogs out of the market, and nobody said anything, they were just allowed to do it. This continued for quite some time. I stopped taking my dog there because I was afraid someone else’s dog would attack her. Eventually, enough people complained about it that whoever runs the thing decided they needed to do something about it. So they just banned dogs from the market. Why not put up signs stating clearly that aggressive dogs and dogs that jump on the tables will be asked to leave? Why not address the owners and ask them to leave? It’s not just the market, I’ve seen this happen with other dog-friendly businesses too. Some say that businesses won’t ask irresponsible dog owners to take their dogs out because they’re afraid of being sued. I think that’s foolish. Put signs up that clearly state what behavior won’t be tolerated, and if people don’t read the sign, it’s their own fault. there’s nothing to sue about. For me personally, I would walk a lot more if I were allowed to bring my dog into stores. Rather than walking the dog and then going to the store, I could accomplish both at the same time, which would be a lot more eco-friendly. Unfortunately, I don’t have time to walk my dog and then walk to the store. Do I think pet dogs should be allowed everywhere? Absolutely not. There are definitely places where pets don’t belong. But they should be allowed more places. They do it in other countries. Why not here?